Page last updated on: Saturday, 2 December, 2017. Postcards of old Gatehouse and district came into common usage during the early years of the 20th Century.. We have collected a few hundred of these and have presented scans of many of them here. 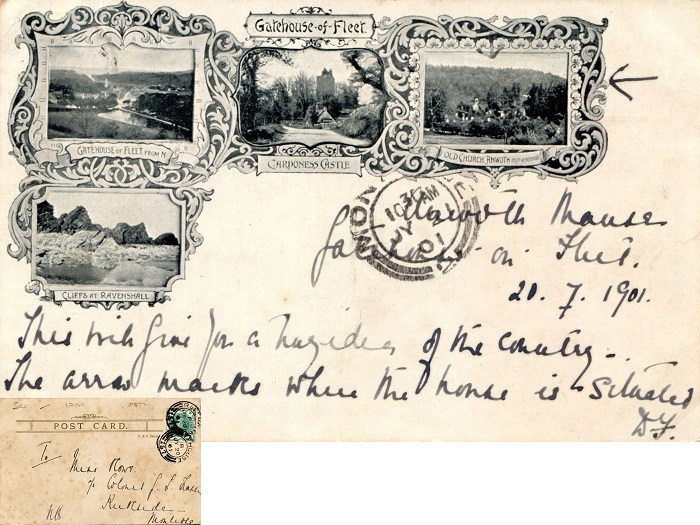 Below is the earliest use of a postcard in Gatehouse that we know of. It was posted in Gatehouse on 20th July 1901 and arrived at its destination in Montrose the following morning. We have arranged our other postcards into a number of different categories. We would welcome comments if you think there are differences between some cards to which we might draw attention, particularly if we are showing a similar scene taken at different times. Help in dating many cards would be most welcome. Please email Graham & Margaret.